I’m leaving this page up here even though the evening was in May 2012 because it includes information about the producers. After the event I wrote a post about some of the wines tasted it which also includes links to others’ blog posts about the event. You can find it here. To celebrate that five organic producers from the Jura will be in London at the same time to present their wines at the two wine fairs REAL and RAW, Wink and her partner Brett Jones are hosting an evening for wine communicators to help create a buzz about the Jura in London and beyond. What’s happening: Three of the five producers will be with us during the event, which will start with an introduction from Wink and continue with a walk-around tasting of 17 wines from all five of the producers. The wines will be a selection of most of the different styles of wine from the Jura – sparkling, red, oxidative and non-oxidative whites, Vin Jaune and Vin de Paille. After the tasting, will be a two course Lebanese/Turkish meal when we will be able to try some of the wines with the food. Who should come: wine writers, bloggers, educators, merchants or sommeliers. 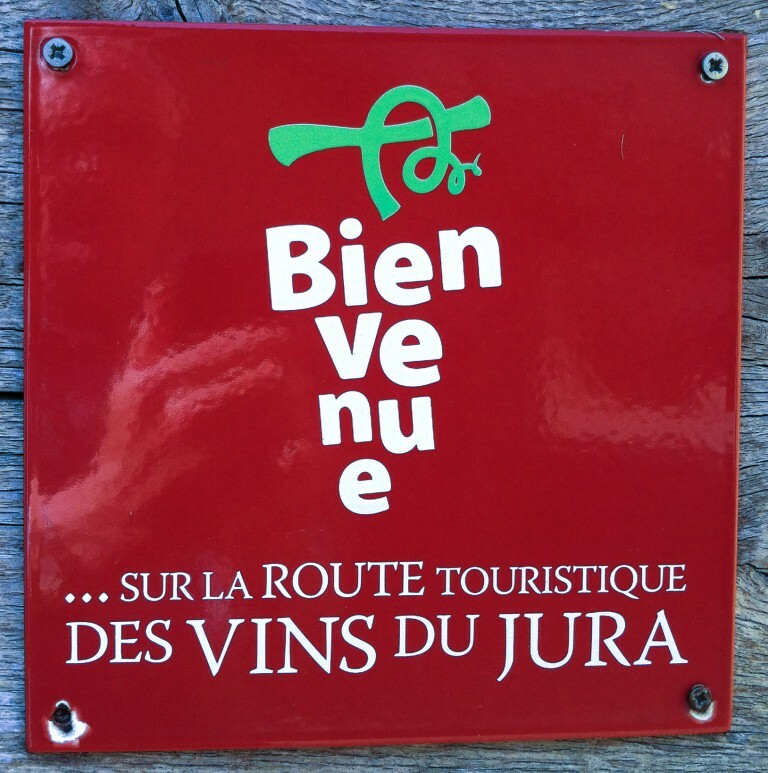 Anyone who would like to communicate and make a buzz about the wines from the Jura. NB: There are only a very few places available. Cost: £30 (or €36) to include the tastings followed by a 2-course meal (mixed mezze, followed by a choice of a main course), mineral water and coffee. Payment by cheque or direct bank transfer, or can be accepted by PayPal (information on invitation acceptance). RSVP: Initially email Wink and if possible accept via Facebook Event page. Note about the cost: Neither Wink nor Brett has any official working relationship with the producers. We are doing everything for the organisation of the event because we believe the region needs more exposure. The producers are not paying for the event, they are simply bringing their wines and will pay for their meals. The Adiva restaurant is providing this space on the basis that we all eat and pay for the meal and corkage on the wine. A big Thank You to Sensible Wine Services, providers of services to the wine trade in the UK, for loan of Riedel glasses for the evening. The estate of La Pinte was started by the Martin family in 1953 and today has 34 hectares of vineyards, of which half is planted to Savagnin grapes (a very large proportion for the region) and the rest shared between Chardonnay and the three red varieties. The estate was one of the region’s organic pioneers and converted fully to biodynamic farming recently, being certified by Demeter in 2009. Winemaking is traditional for the area, and they make a wide selection of wines, with several blends as well as the usual single varietal wines and Jura specialities. As one of the region’s larger, quality-minded domaines, La Pinte has always been very good at promoting the whole region and in 2011 hosted the first organic wine fair in the region Le Nez dans le Vert. General manager and viticulturist Bruno Ciofi, joined by Julie Martin will be with us for the evening. The only one of our producers for the evening based in the south of the region, siblings, Jean-Etienne, Antoine and Marie-Florence Pignier run this estate from an amazing 13th century monastery in a village up on the hill above the capital of the Jura, Lons-le-Saunier. The estate has been in the family since the 18th century and the siblings’ parents converted from polyculture to full time wine-growing in 1970. Today, the family has 15 hectares which they converted first to organic and then to biodynamic farming methods, becoming Demeter certified in 2006. The southern part of Jura (appellation Côtes du Jura) is known for making wines in an even more traditional style than the north, but the Pigniers have launched several wines that break away from this tradition, whilst always respecting their very individual terroir and continuing to make traditional wines too. In their fine old cellars, today they shun chaptalisation and other additions to the wines, using SO2 in a small way with a few wines avoiding it completely. If you are in the region, don’t fail to stop here to visit and arrange a tour of the cellars. Jean-Etienne will be spending the evening with us. Philippe worked his vineyards for 30 years, from 1975 – 2005 belonging to the local wine cooperative, before starting to make his own wines from 2005, inspired by his neighbour Pierre Overnoy. Today he has 7 hectares growing all five of the Jura grape varieties plus a little Melon à Queue Rouge (a rare type of Chardonnay). He works his vines organically with certification due this year. His cellar methods are resolutely old-fashioned and his wines are unfined, unfiltered and usually have no added SO2 at bottling, though some may be used as required at harvest. Each wine is labelled with a fox (on the left for red and the right for whites), and several wines have names referring either to a particular vineyard, a piece of French slang, or a mythical story. Philippe’s son Tony has now joined him to work on the estate. Wines imported to the UK by Les Caves de Pyrène. Alice Bouvot and her partner Charles Dagand started their small estate in Arbois in 2005 by leasing a small area of vines and buying an old vigneron house in the town. The following year they were able to buy 3.2 hectares, and now have around 5 hectares all farmed using biodynamic methods, with 55% white and 45% red varieties. Their vineyards were certified biodynamic by Demeter from the 2010 vintage, having already received organic certification and in 2012 they have become proud members of Renaissance des Appellations. Previous to getting together and starting their estate, they had both studied viticulture and winemaking, and worked in many different regions, for Alice (a qualified oenologist) that included stints in Napa, Chile and New Zealand. In the cellar, they believe in adding nothing, and have worked without SO2 additions since 2008. Both keen opera fans, they have named their wines after characters appearing in Mozart operas. This hard-working, dedicated couple also make time to bring up their two young children, Célestin and Anatole. Evelyne and Pascal Clairet both had a background in wine before they started their Jura wine estate in 1991. Now they have nearly 7 hectares of vineyards and were one of the earliest estates in the region to convert to biodynamic farming methods, being organic almost from the start. They are also active members of the natural wine movement in France, following their philosophies as the wines allow. They avoid SO2 additions if they can, but not ‘religiously’. Aside from this, they have always been innovators in the region, being one of the first to make several different cuvées of Savagnin, as well as their whole berry maceration Poulsard. Their wines are well explained on their website even in English (!) and on their informative back labels. As well as bringing up three children, their love of sharing wines with food and friends led them to open their own summer bistrot in the centre of Arbois, and to become partners in the Antidote wine bar in London. Evelyne will be with us in the early part of the evening.